Marks the 34th consecutive year it has increased the dividend. As it has for the past 34 years, coatings specialist Sherwin-Williams (NYSE:SHW) this week announced it would be increasing its quarterly dividend effective with the first quarter. 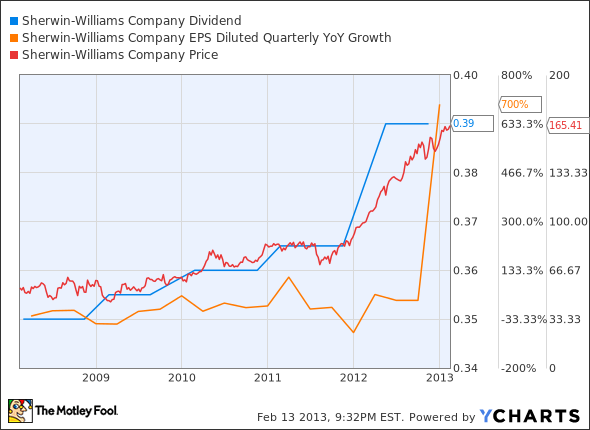 The quarterly dividend will rise from $0.39 per share to $0.50 per share, a 28% increase, payable on March 8. Sherwin-Williams has a long history of paying dividends, going all the way back to 1885. After losing $8.2 million in 1977, it suspended the payment, but reinstated it after John Breen became CEO in 1979 and has raised it every year since.